Before I met my partner, I had no palette for beer, nor any desire to sit down to a brew at the end of the day. Thankfully, he has helped me see the error of my ways. After many tasting nights, beer related discussions and brewing experimentations, he (and our beer-loving friends) have helped me to appreciate beer.. GOOD beer. The LCBO (for you non-Ontarians) is the Liquor Control Board of Ontario - ie. the only place to get all your alcoholic beverages. During his trips to Ontario, my partner always made a habit of stopping at every LCBO he would come across - just to see what they had. You never knew when you could strike gold and find some limited edition, extra flavourful beverages. Then you could brag about how good they tasted to your friends (or, if you were feeling generous, let them have a tiny taste). I have picked up the LCBO-hopping habit as of late, and on my most recent trip to Owen Sound, I struck gold - a LOT of gold. Not only was the store MASSIVE, but it had full stock of all my favourites and even more delightful looking brews. I could barely control myself - never before had I seen so much good beer in one place. Usually there are a couple special ones at any given LCBO, but Owen Sound hit the jackpot. The small towns just sometimes have it all. Needless to stay, I stocked up for a while (or not?) and picked up the stellars that were new, or I hadn't seen in a REALLY long time. Here are the highlights from my plunder. (For all you beer aficionados out there). 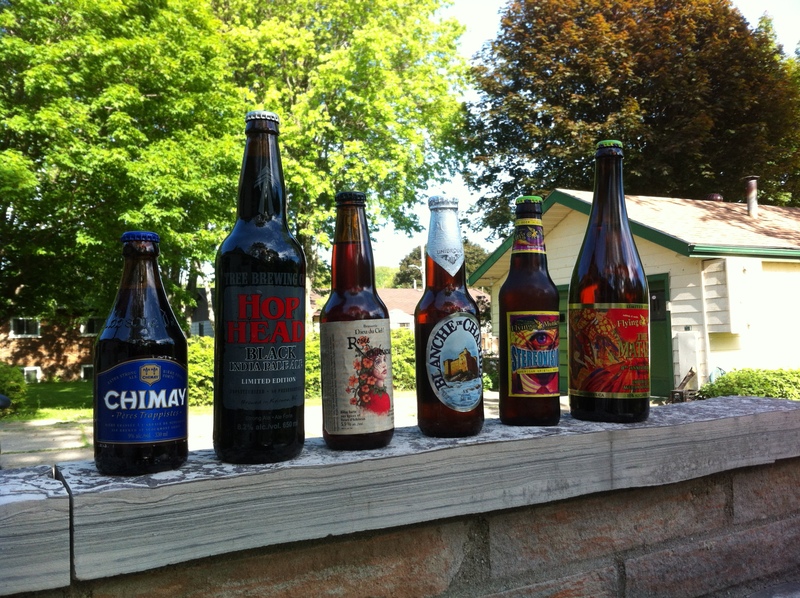 Left to Right: Chimay Grande Reserve, Hop Head Black IPA (Tree Brewing Co.), Rose d'Hibiscus (Dieu du Ciel), Blanche de Chambly (Unibroue), Stereovision (Flying Monkeys - wheat beer), The Matador (Flying Monkeys - Limited Edition 8th Anniversary Ale). More highlights: Muskoka Legendary Spring Oddity and Red Racer IPA.